CoLab Radio » Blog Archive » Thank you, Sebastiao, for your gifts to CoLab. I love this photo of Sebastiao because the poster in the background says ‘possibilities’, and that’s what Sebastiao’s expression is full of, too: possibility. Sebastiao was with CoLab in its formative years. He helped us understand where we were failing and where we were succeeding. He broke our mental barriers so that we could find newer and better paths to follow. Next week he will be returning to Peru after five years in the United States. When he came here he was already fluent in Portuguese and Spanish, but he couldn’t speak English. Now he is fluent in English as well. He is entering a new phase, possibly pursing a PhD. As a young man he was offered a full scholarship to earn a doctoral degree in Physics at the University of Southern California, but turned it down because he decided that Physics could not solve the world’s problems. It was a time of turbulence: the U.S. was at war in Vietnam and Brazil was suffering under a dictatorship. Sebastiao returned to Latin America for another adventure. Sebastiao has shared his life with us in nine self-defined phases. Listen to his story below. Sebastiao wrote a summary of his journey as a guide for making this audio file. You can read it as you listen. 1. My aunt’s house, exploring the train in a trip and knowing my cousins, 9 years old. 2. Rocket experimentation, a short and explosive science project, 17 years old. 3. ABC of relativity, the discovery of theoretical physics, 17 years old. 4. Listening the wind, looking at Latin America from the bottom of the pyramid, 21 years old. 5. Social activist, a theatre group in Brazil and an epic age in a turbulent Peru, 24 years old. 6. Experimenting development in an NGO and backing to the middle class, 33 years old. 7. Cognitive facilitator, inventing two new professions, 300 workshops, 6 books and the life in the airports, 42 years old. 8. MIT labyrinths, back to school and inspirations of scholarship, 56 years old. 9. The future, the cognitive divide and the reinvention of my life, 62 years and beyond. Sebastiao: You are one of the best teachers and most inspiring people that I’ve met since coming to MIT. Sorry I couldn’t say goodbye in person (only in spirit, from LA) but I’m so glad our paths crossed and hope to reconnect with you many times in the future. All the best to you. Boy are we going to miss you, Sebas! What a treat it was to spend time with you yesterday hearing stories about your photos, your thoughts about CoLab and about each if our work, and about politics! Thanks for all the gifts you have given, and will continue to give us. We all will look forward to your annual visits in January and the programs we will create around them. Travel well, keep us in your heart and in your mind. We, of course, will do the same. 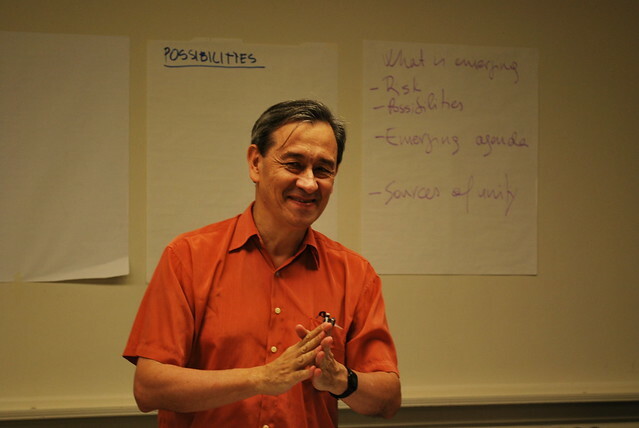 Sebastiao – I am so happy to have finally been able to “see” you in expert workshop facilitation mode. Thank you for sharing this experience with me. You are a gifted leader. We at CoLab and at MIT have become better and more effective in your presence.